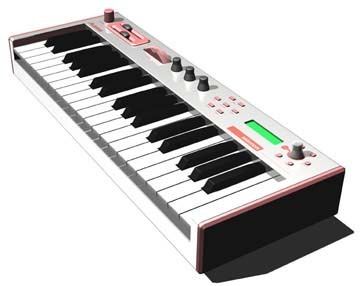 The Micron has the same sound engine as the Ion in a compact 3-octave keyboard . The Micron is compatible with Ion programs and holds over 1,000 programs and multitimbral setups. The Micron offers continuously variable wave shapes, plus sync and FM synthesis. 16 filter types are included, along with 2 LFOs with multiple wave shapes and sample & hold. The Micron has 8-voice polyphony with 3 oscillators per voice, and is 4-part multitimbral. The Micron offers a programmable step sequencer, arpeggiator, rhythm sequencer for drum kits, and dynamic realtime phrase sequencer, all of which sync to MIDI clock. A powerful and intuitive modulation matrix is built in. Effects include a 40 band vocoder that does not use up any polyphony, 4 drive effects, and stereo bus effects, including reverb. For assignable realtime control, the Micron offers 3 knobs, 2 modulation sliders, and a pitch wheel. The knobs are 360 degree potentiometers with 12-bit resolution, yielding 32 times the resolution of a typical MIDI controller, yet still compatible with the latest sequencers via NRPMS (Non-Registered Parameter Numbers). entire frequency range. Lightweight and portable, the Micron keyboard contains 37 keys with velocity and release velocity sensitivity. There are 2 analog outputs and 2 stereo analog inputs balanced and using 24-bit conversion. Also included are connections for expression pedal, sustain pedal, and MIDI In, Out, and Thru. Developed by the same sound design team that programmed the Andromeda synthesizer, the Microns presets cover a variety of genres, including many new tonalities, as well as classic synth emulations. Ion programs can be transferred to and from the Micron via MIDI, and more new sounds will also be available from the Alesis website.